Join us for another Passport in Time oral history project as we explore the history and future use of the National Register of Historic Places (NRHP) property known as Forest Lodge! This 872-acre estate is part of the Chequamegon-Nicolet National Forest, and was gifted to the U.S. Forest Service (FS) in 1999 by Mary Griggs Burke, whose family owned the property for three generations. Her wish was to preserve the natural and cultural elements of the recreational retreat established by her grandfather, Crawford Livingston II, as a permanent part of the North Woods landscape. 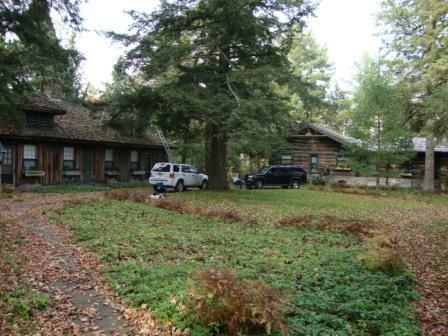 Mrs. Burke retained a life estate to a 100-acre area that includes the Forest Lodge buildings and their grounds until her passing in 2012. The FS now manages the entirety of the property, under lease with Northland College for the purposes of the Mary Griggs Burke Center for Freshwater Innovation. The remainder of the 772-acres of unreserved lands is open for non-motorized recreation. Four Congressionally-designated special management areas were established as part of the gift, each named to honor Mrs. Burke or her mother, Mary Livingston Griggs. They are as follows: the Mary Livingston Griggs Historical Special Management Area, the historic district which consists of the Forest Lodge buildings and grounds; the Mary Griggs Burke Botanical Special Management Area, an area of unique ecological plant communities, located south of Garmisch Road and encompasses the Forest Lodge Nature Trail; the Fairyland Research Natural Area, an area of old growth hemlocks, which lies west of the Mary Livingston Griggs Historical Special Management Area; and the Mary Griggs Burke Scenic Special Management Area, the extensive and undeveloped Lake Namakagon shoreline, which includes the remainder of the estate. PIT participants will start out with a “course” or refresher in oral history techniques and theory. Then, equipped with these skills, we will fan out to interview informants who have been part of the transformation of Forest Lodge from the end of a private inholding to public domain with the FS. All of our recorded data will be transcribed and accessioned into the Wisconsin Historical Society's collections. Recording equipment will be provided, however participants are welcome to bring their own equipment and, if preferred, may wish to include a digital camera in their “kits.” Our projects are a great success, and always prove to be very fascinating. We hope you’ll join us this summer for another foray into Wisconsin’s historic past!